Most firms are still stuck managing the compliance services at the expense of the advisory work. An administrative assistant in your office receives a great performance evaluation and then asks you if they can be put on salary. In many CPA firms, it sometimes becomes a dilemma. Be sure you are abiding by the federal overtime rules. Here’s a link to an article that owners, firm administrators and HR managers might need to read. It could also be shared with your entire team. Your CPAs all need to be able to advise clients when this topic arises. Don’t work too many long hours this weekend. Next weekend you should be all done – no working! Many firms are able to do this when the due date falls on a Monday. My first job at Gleason's Bar in Cleveland was $800 a week, when I was making $92 a week with overtime at the automobile plant. I read the above phrase and it stayed on my mind. I must admit that it hit home with me. I have known many very strong women over my long career. Some inspired me and some completely turned me off. Maybe you can identify with that. As I think back, the reason that some strong women irritated me was not that they were strong. It was because they were irritating. I have known mild-manner females who have also irritated me. Such is life. There have certainly been many males, strong and mild, who have irritated me, too! The passage and these thoughts inspired me to look a little deeper into the issue of strong females. I do believe that women in the profession of public accounting need to have strength and grit if they want to survive. This is from the site Science of People: The term ‘alpha female’ is thrown around casually, but what does the science have to say? What is an alpha female? Here is the real definition of an alpha female, based on the latest research. The Alpha Female: 9 Ways You Can Tell Who is an Alpha Woman. Read the article and share it with other females in your firm. There is no way to put it nicely. If you want your client to get their tax information to you on time, you have to remind them and remind them and nag them. My dentist reminds me of my appoint four different ways: phone, email, U.S. Mail and text. For the dentist, I must reply with a “C” to text my confirmation. Do you have a system in place to remind your clients individually? Sad to say but it must be repetitive. It is easy these days to send out a bulk email. It might be ignored but it is still a great reminder. Here’s a sample of what one of my clients sent out last week. Specifying a due date helps. 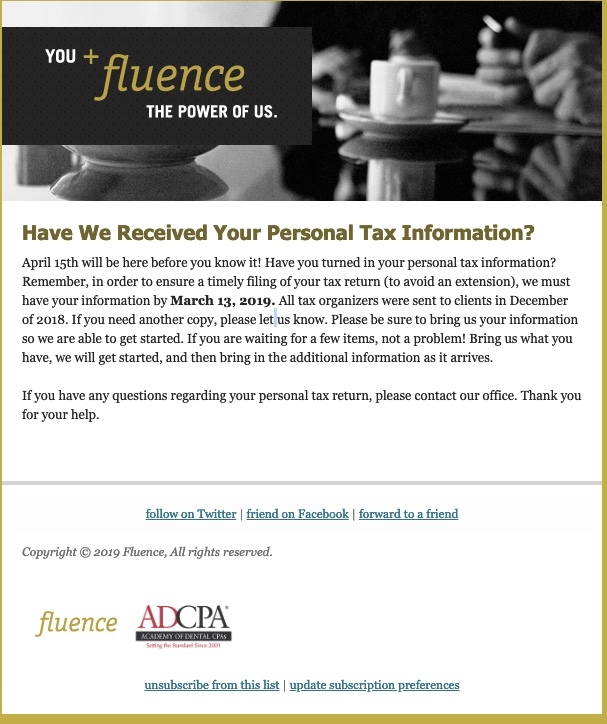 They ask for individual information by March 13th! Use their example and do the same thing. Be sure to check out an upcoming webinar sponsored by CPAFMA (CPA Firm Management Association). Failure to detect fraud claims continue to happen against accounting firms and claims go beyond the scope of audit services. This session will discuss in an overview fashion what fraud is and steps you can take to hopefully mitigate this exposure. We will look at claim scenarios and discuss what could have been done to head off such claims.